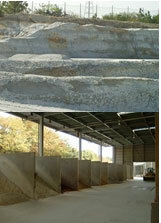 A variety of materials，such as high quality clays and feldspars，are brought in from quarries in Seto and Tajimi. A variety of clay rocks are crushed into fine grain powder and mixed to from the tile body. The powder is further mixed with aggregates often made of sand and/or fine stone chips， and water. Then it is kept saturated for two days. The prepared materials are vacuumized and shaped by an extrusion machine. At this point，tiles exceeding size allowance are remowed. Extruded tiles are dried for a few days sampling. Inspections are carried out to check the sizes and shapes of tiles .some tiles are glazed after drying. as required. Properly shaped tile pieces are lined up and loaded onto a kiln cart. Tiles are fired inside the tunnel kiln under controlled temperature for approximately 36hours. Wared tiles are removed and defects such as chips and scrapes are inspected by automated machines. All tiles which pass Nittails quality standards are packaged on automated machines and shipped out.